The two names AL-QADIR and AL-MUQTADIR are derived from the Arabic word qudrah which means ability and power. Allah, Praise and Glory be to Him, said, “Say, He hath power to send calamities on you, from above and below, or to cover you with confusion in partystrife, giving you a taste of mutual vengeance each from the other.”(AN‘AM, 65), “For We do determine according toneed; for We are the best to determine.” (MURSALAT,23), “..but We seized them with such Penalty as comes fromOne Exalted in Power, Able to carry out His Will” (QAMAR, 42), “In an Assembly of Truth, in the Presenceof a Sovereign Omnipotent” (QAMAR, 55). Allah, the ABLE possesses perfect Ability; nothing canever disable Him; He is bound by nothing. He needs neither modality,mediation, tool, nor specialized organ. No defect can ever befall Him,and nothing can stop Him from accomplishing what He desires; He is ableto create the non-existent and make the existent perish. When Allah, the ABLE, wills something, it is fulfilledand done, and when He does not will something it is never done. Beingthe ABLE, He invents and originates every existing thing; His originationis unique, unforeseen and independent of any aid or help. Allah, the POWERFUL, has an overwhelming Power and holds control over everything. Out of His Mercy and Grace, He mends His creatures’ lives in a way unparalleled. He says, “..it is only God Who prevails over all things” (KAHF, 45). 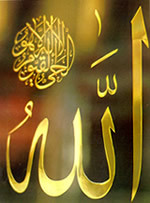 Glory be to Him, the ABLE, the POWERFUL, Praise and Glory be to Him, He is Allah.